The number of pirate attacks off the coast of Somalia has increased, and NATO is warning that pirates are once again ready to attack ships traveling through the Indian Ocean. “In the last few years it has been the case that, come October, when the South West monsoon weakens, the pirates have been able to put to sea and we have seen the number of attacks on merchant vessels increase,” Rear Adm. Hank Ort said in a statement. “We are warning vessels that reports show that there are pirate groups operating already in the Indian Ocean, Arabian Sea and Gulf of Aden. Our naval forces are not complacent and remain vigilant. 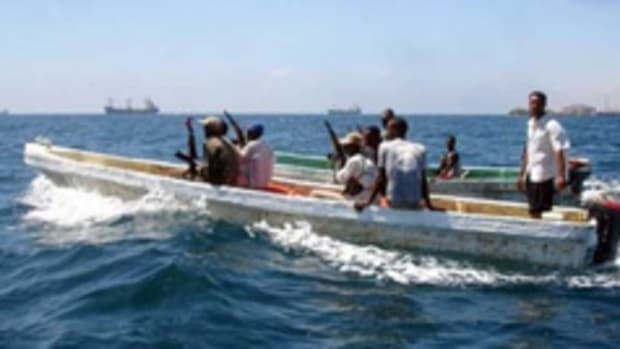 Despite the lull in pirate attacks over the summer due to the monsoon, they have continued to patrol throughout the region,” he added. During the last week of September there were three attacks and one approach in the southern Red Sea, two incidents of suspicious activity in the Gulf of Aden, one incident of suspicious activity in the Arabian Sea and a disruption of a whaler Pirate Action Group in the central Somali Basin, NATO reported. Increased pirate activity continued during the weekend, with three ships reporting attacks Oct. 2 in the Gulf of Aden, the southern Somali Basin and the Arabian Sea. All three were safe after repelling the pirates. NATO announced its continuing commitment to counter piracy by extending Operation Ocean Shield until December 2012.